Parallel Wireless, Inc., the leading provider of the world’s first end-to-end software-based unified network solution across All Gs (2G, 3G, 4G, and 5G), today announced that Kalimat Telecom, a subsidiary of Kuwait’s Trade Links, has selected Parallel Wireless to build out their mobile broadband network in Iraq. According to the GSMA Mobile Economy: Middle East and North Africa 2018 report, Iraq has only a 52% wireless Internet penetration rate, presenting a great opportunity for telecom service providers in that market. Poor infrastructure and high operating costs are currently stunting development. 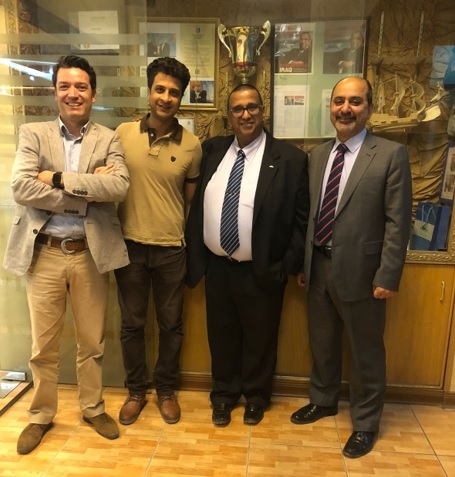 Kalimat recognized the inflexibility of legacy cellular solutions to bring digital services to the Iraqi population that is hungry for digital services. Parallel Wireless's fully-virtualized HetNet and core solutions enable Kalimat to deploy a distributed virtualized mobile broadband network delivering consumer and enterprise wireless services across the region cost-effectively and on an accelerated timeline. The Parallel Wireless software-based architecture delivers ease of deployment and the flexibility required to meet the changing needs of this market. This will be one of the largest fully virtualized commercial mobile broadband networks in the region. With Parallel Wireless, the overall CAPEX, OPEX and complexity associated with building out and managing the network is significantly reduced through network automation. As a result, the high-speed mobile broadband network will provide the region with a range of advanced new residential and business voice and data services, helping with the digital society realization. Trade Links is a privately held global services company with business operations in the USA, Kuwait, Iraq, Afghanistan, UAE, Qatar, Bahrain, China and Philippines. It caters to a variety of industries through several business divisions. These business divisions operate under the Trade Links name and provide multiple product lines and services including aviation, engineering and construction, communication, logistics, transportation, HVAC and refrigeration, housing and project support. With its mission to simplify the globe and redefine boundaries, Trade Links was established in Kuwait in 1997 and has grown into a multi-dimensional corporation with business interests in many industries. For more information, please visit www.tlinksme.com/divisions/telecom. Parallel Wireless’ mission is to connect the 4 billion unconnected people by reimagining the networks. The unified end-to-end 2G GSM, 3G UMTS, 4G LTE, and 5G Open RAN solution enables operators to deploy any G cellular networks with real-time SON as easily and as cost-effectively as enterprise Wi-Fi whether for rural, enterprise, public safety, M2M, IoT, Smart Cities, or dense urban. The company is engaged with many leading operators worldwide and has been named as the best performing vendor across all Gs by Telefonica and Vodafone. Parallel Wireless’ innovation and excellence in multi-technology open virtualized RAN solutions has been recognized with 50 industry awards including MWC19 GLOMO nomination for best mobile network infrastructure along with Huawei and Ericsson (NASDAQ: ERIC). Connect with Parallel Wireless on LinkedIn and Twitter.